Welcome to Nepal , the land of adventure! Kathmandu Valley , the capital of Nepal , is situated at 4,423 ft. above sea level. The valley is surrounded by semi-green hills, terraced fields and towering snow-capped peaks in the backgrounds. Kathmandu , Bhaktapur and Patan are the major towns in the valley. All three are of great historic, cultural and artistic interests. The architectural history of the valley is said to have begun with the Lichhavi and the Malla kings. Today, the ancient monuments and temples are the center of attraction for visitors, particularly the seven World Heritage Sites, designated by the United Nations Educational, Scientific, and Cultural Organization (UNESCO). Please find brief descriptions of each site in the itinerary below. Trisuli River may not offer extreme challenges for those experienced and thrill seeking paddlers, but it offers an easy float to some exciting rapids every now and then. Trisuli is good for those who have short time and want to sock in the Himalayan river while traveling to Chitwan Jungle Park safari or to Pokhara trekking. It is perfect for first time rafters to experience white water rafting and families looking for easy river trips. The panoramic view along the river is superb. Royal Chitwan National Park is a well planned and developed resort destination in southern Nepal . The variety of animals found in Chitwan Jungle includes the endangered Royal Bengal Tigers, one horned-rhinoceros, four-horned antelope, striped hyena, bison, Gangetic dolphin, gharial crocodile, reptiles, rhesus monkeys, and sloath bears. There are over four hundred different species of birds including marsh mugger peckers and other migrating birds that make their home here. The five to six feet tall Elephant grass provides an excellent habitat for wildlife to thrive here. Highlights of the Chitwan Jungle Park activities are elephant rides to see the elusive Royal Bengal Tigers, one-horned rhinos and other animals; dugout canoe trips to see Gangetic dolphins, gharial crocodiles and the beautiful scenery; bird watching; a tour of the Tharu village to explore their culture and to see how they live. The Tharus also come to the resorts to present their traditional song and stick-dance performances, and lastly play and bath with elephants in the Narayani River . 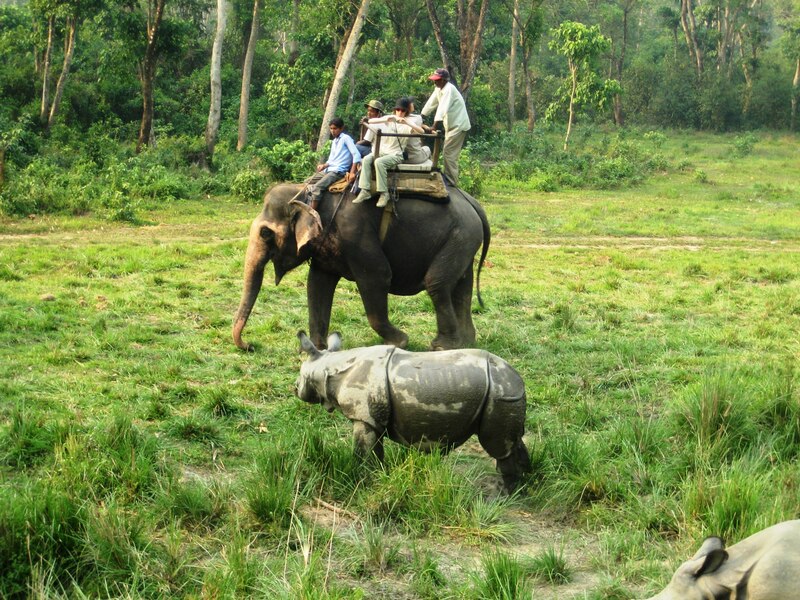 Our Chitwan Jungle Park package tours are fully catered. Accommodations of various standards are available and are priced accordingly. The following program is a typical one that we offer out of Island Jungle Resort. The package prices are based on the standard of the resort accommodation and other services associated. Please let us know at the time of booking whether you are looking for a jungle adventure with basic comfort or high standard of accommodation with pools. Upon arrival, meet at Kathmandu Airport and transfer to hotel. Then, we visit the fine collections of the Royal Museum inside the old palace of Kasthamandap from which the name Kathmandu was derived. Our tour ends here; then walk or drive back to the hotel. Early morning breakfast, around 6.00AM , drive to Trisuli River rafting put in point. Full day of action packed rafting down the Trisuli River plunging into some of the exciting rapids of Trisuli. Lunch is served along the river. Then, take out, pack up and drive to Chitwan Jungle Park . 5:30 a.m: Wake up call followed by tea or coffee. 6:00 a.m : Bird watching / Elephant Safari / Jungle walk. 9:30 a.m : Crocodile walk. A 45 minutes walk through grassland and forest upstream of the Narayani river. Board boats to observe crocodiles along the bands while floating back to the camp. 3:30 p.m : Elephant Safari /Jungle Walk / Visit Observation Tower / Nature Walk with Boat Ride. 9:30 am : Visit a local village to see and learn about the people of Chitwan and Return to camp. 3:30 p.m : Boat excursion to Amaltari Ghat and return by jeep / landrover. 6:00 a.m : Bird watching / Elephant Safari /Jungle walk. 9:30 a.m : Drive to Kathmandu and remaining day at leisure. Day 8 Departure from Kathmandu . Note: The above tour cost is based 4-5 star quality boutique hotels and none star quality hotels. If four five star hotel accommodation is required, add US$150 per person per night. Destinations: Kathmandu Cultural World Heritage Sites, Trisuli River Rafting and Chitwan Jungle Nature World Heritage Site.